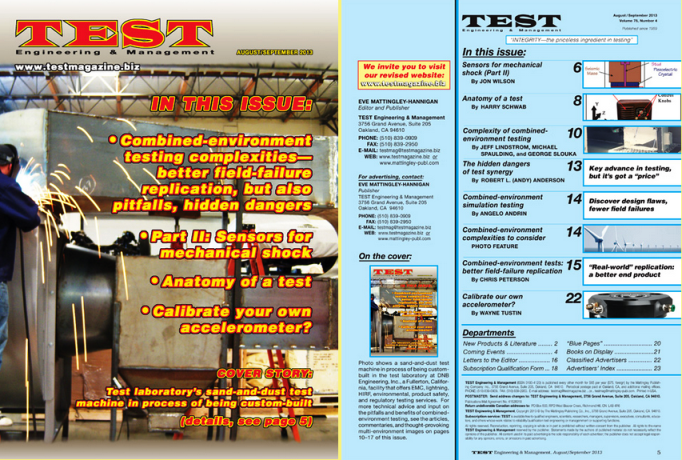 DNB Engineering Inc., a full service test lab and world leader and recognized expert in certification testing, recently was featured in the August/September 2013 issue of TEST Engineering & Management. This magazine has been a print publication for 54 years and is published 6 times a year. TEST Engineering & Management provides a forum for the exchange of state-of-the art ideas and information amount test engineering professionals. They are edited for the interests of those who perform physical/mechicnal testing and environmental simulation. This entry was posted in DNB Updates and tagged article, combined environmental testing, DNB Engineering, environemental testing, magazine, test engineering and management. Bookmark the permalink.